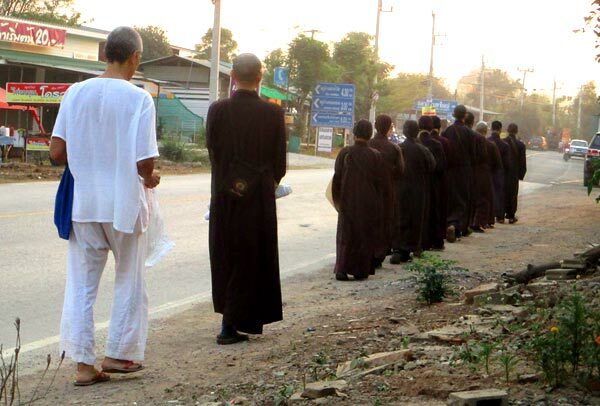 A forward-thinking monk at Thai Plum Village, Bro. 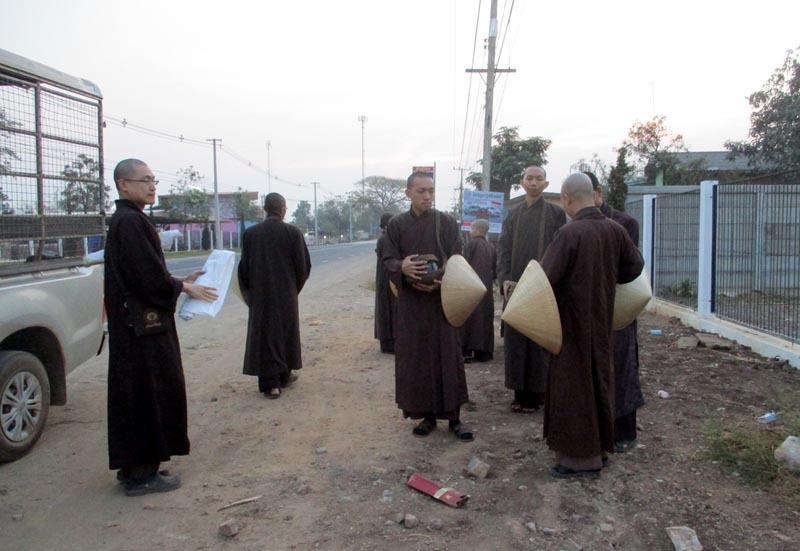 Nguyen Luc, asked if I could be a part of the monastics' alms round to a nearby village by carrying the food received by the monks and nuns. It was a privilege I wouldn't pass up. 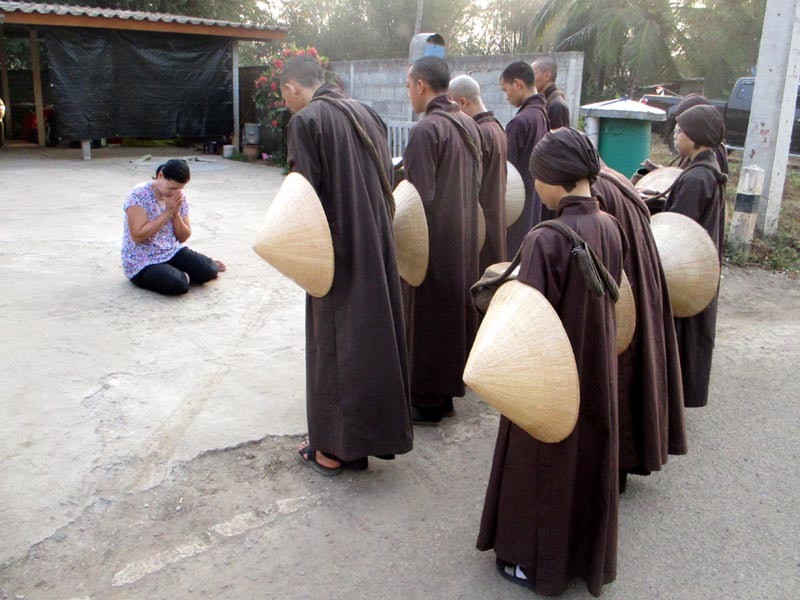 An alms round is when the monks and nuns go out of their monastery and essentially beg for food. 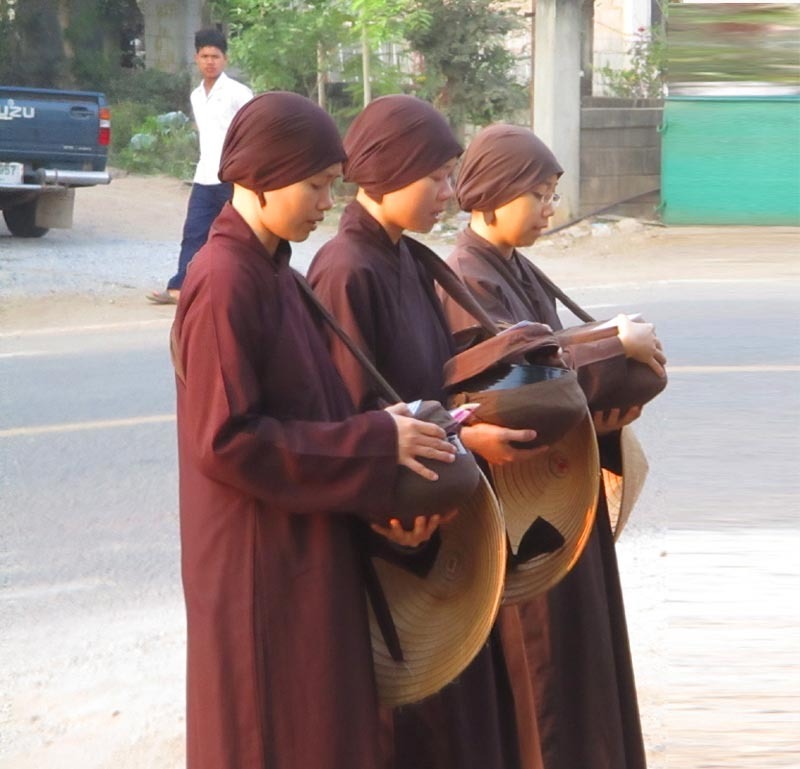 They are given food / water and sometimes money by householders (people who earn a living and not in the monastic order). 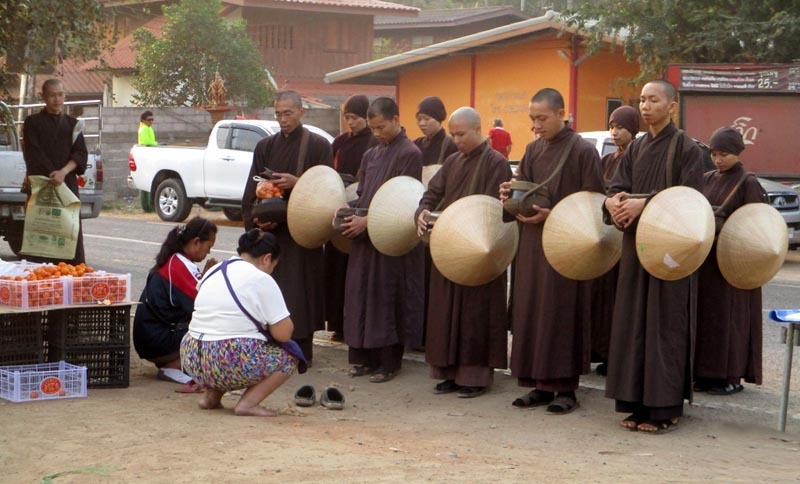 The householders in turn, are given a blessing by the monks and nuns. 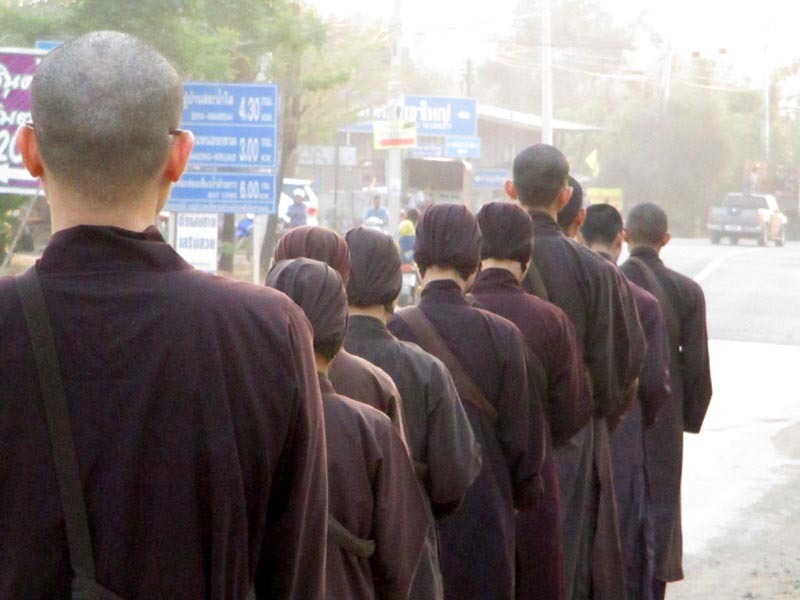 Monastics, by tradition, cannot earn a living in order to devote their lives in the pursuit of self-realization. As such, they have to beg for food. 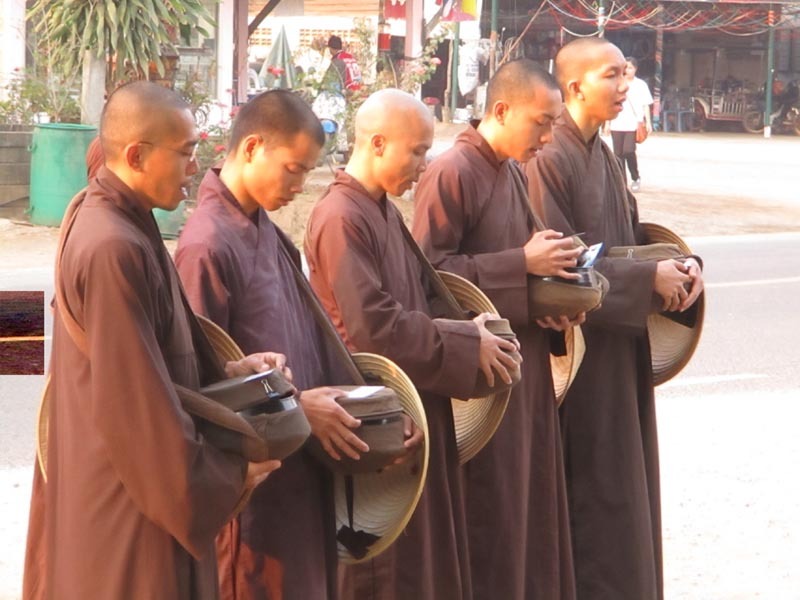 This is a tradition that dates back to the time of Buddha. 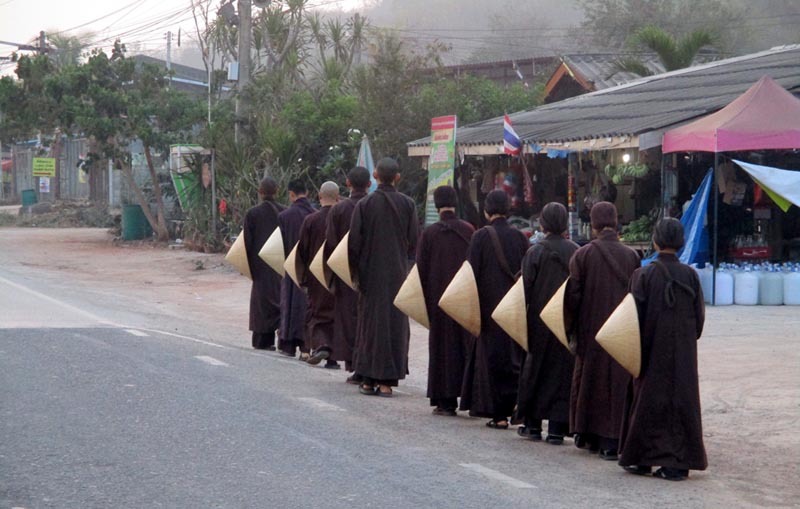 The first and last time I witnessed the alms round was in Luang Prabang when I was a passing backpacker. 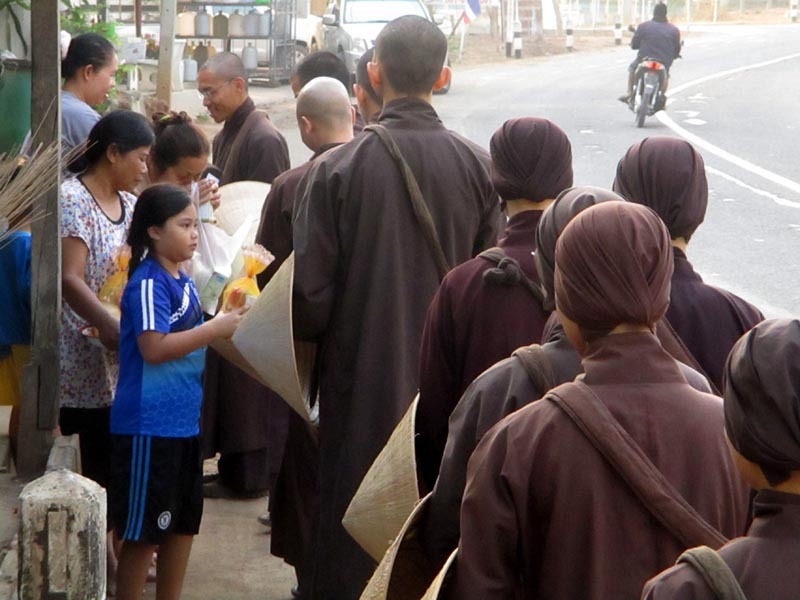 The monks came out of their temples to a waiting line of tourists who came prepared very early in the morning to give them food. 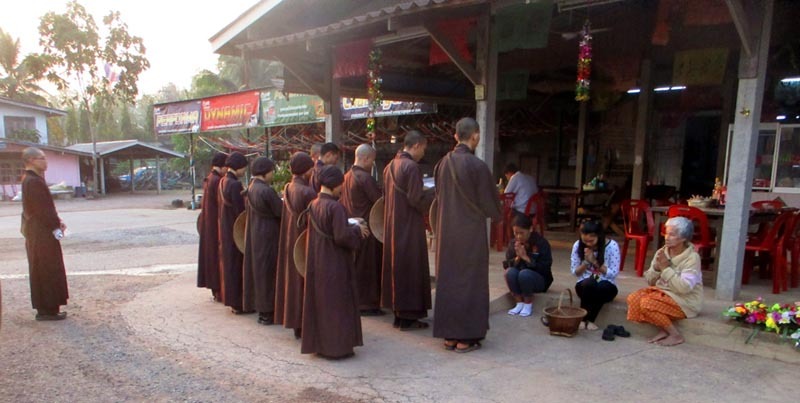 This ritual became popular in Luang Prabang that it has become a tourist attraction. 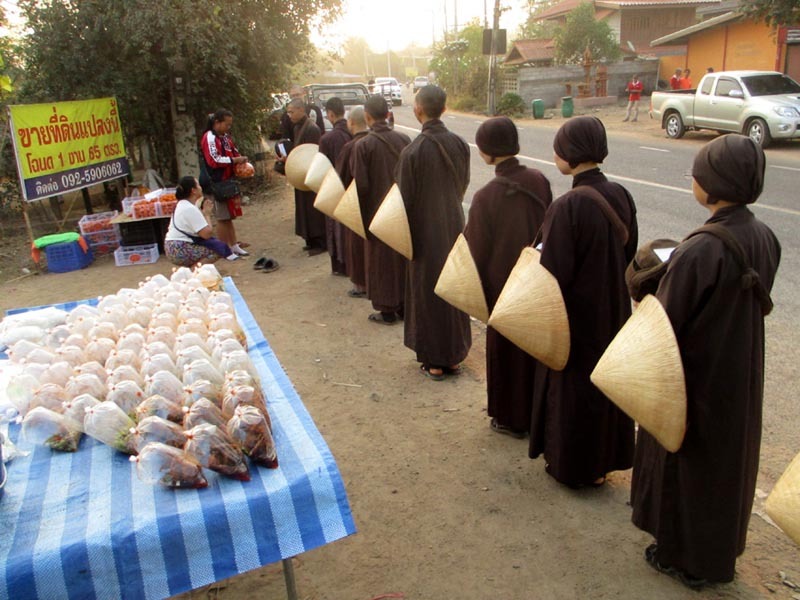 The week prior, some monastics already made their rounds in the village to distribute leaflets letting them know that monks and nuns from the Thai Plum Village would be passing through for their alms round. 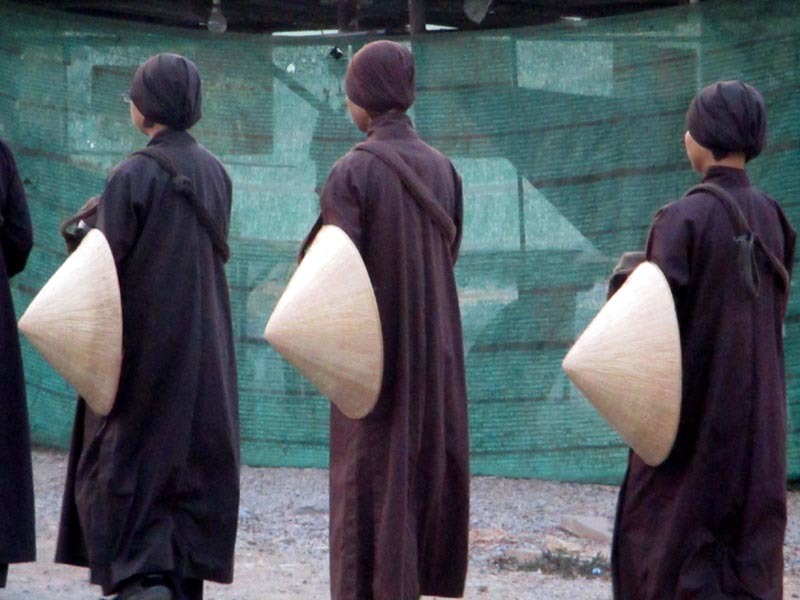 This would prepare the villagers to make ready anything they'd like to give the monastics. 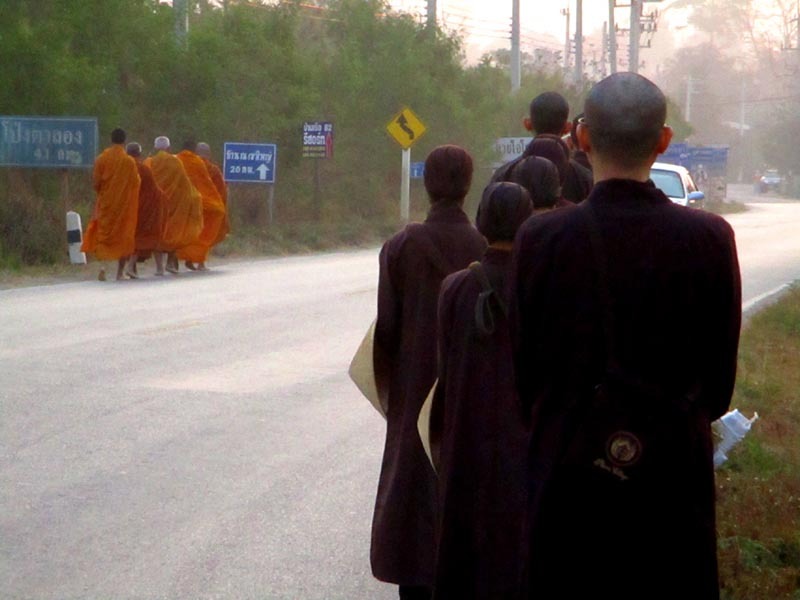 Buddhism, in the last 2500 years since the time of Buddha, has branched-off to many monastic traditions and remains the staple religion in Thailand. 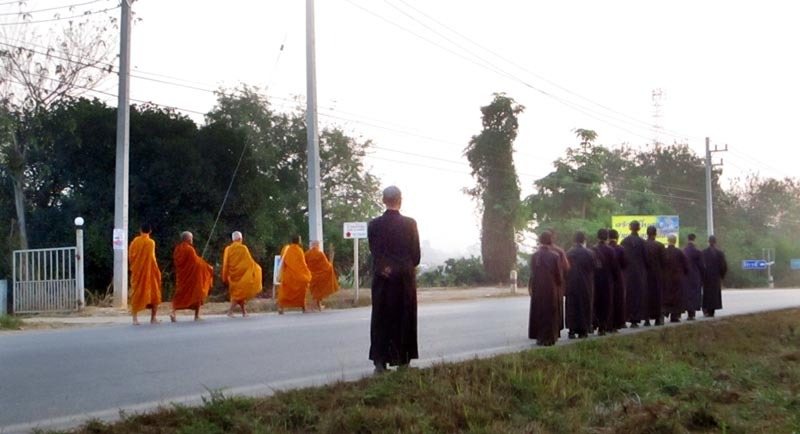 The widely accepted tradition is the Theravada Buddhism. 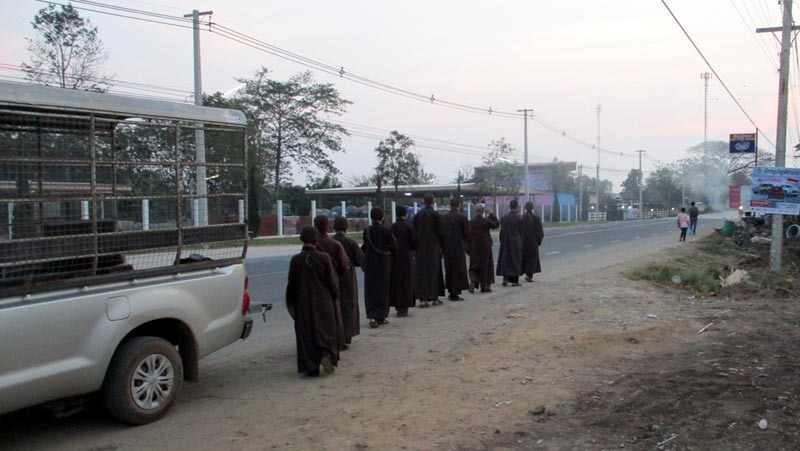 These are the monks who wear the dark mustard colored robe. 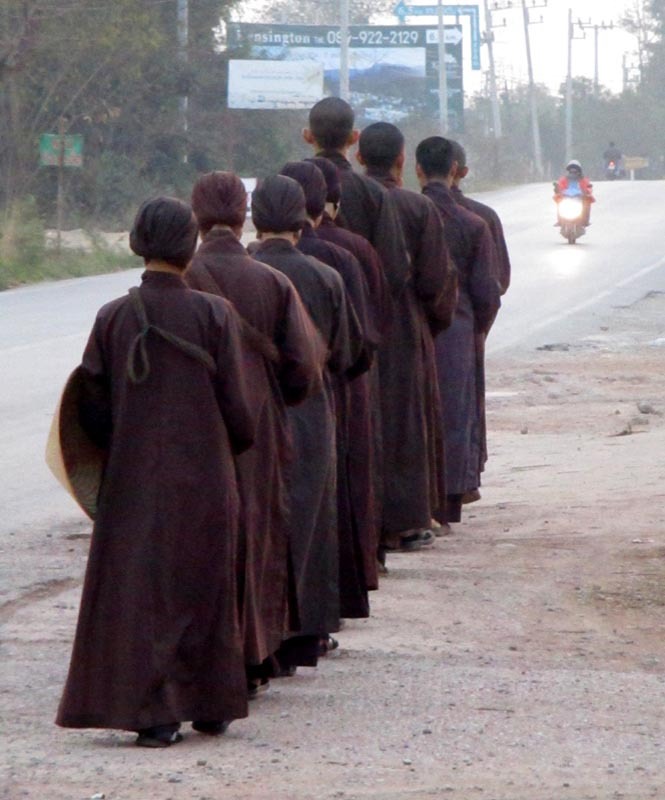 They subscribe to the original tenets of Buddhism which is rigid and steeped in the ways of the old world. They do not cook so they have to beg for food. They only eat one meal (or 2) a day. 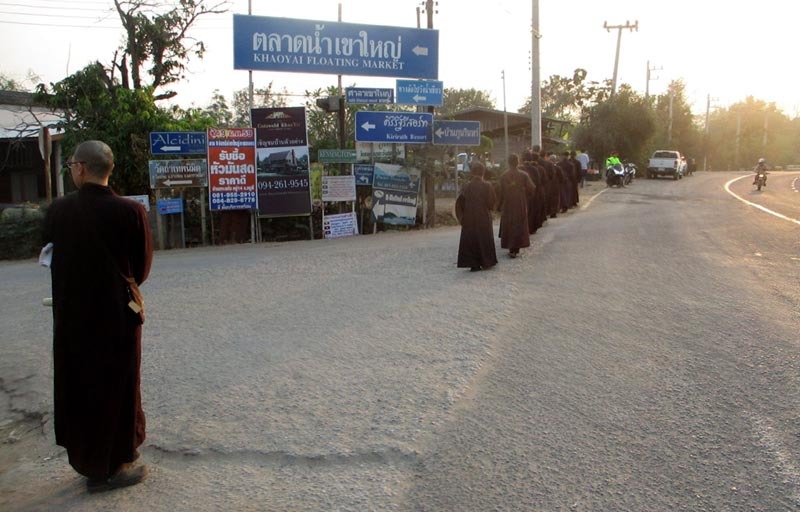 These are the monks the Thais are accustomed to. 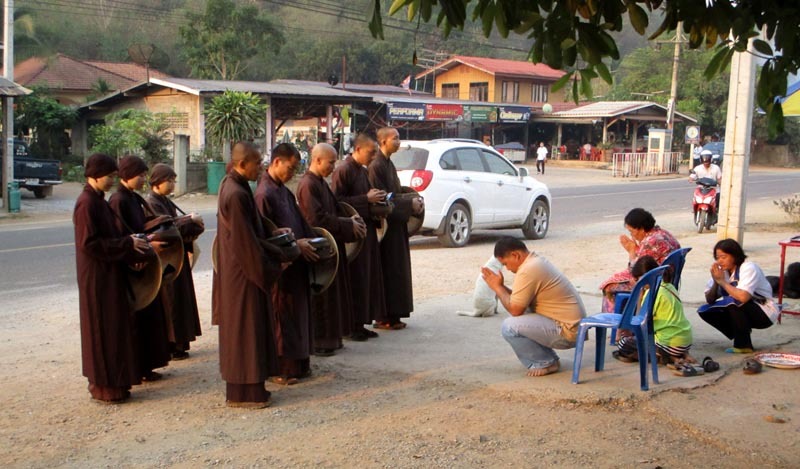 The other branch of Buddhism is the Mahayana Tradition to which Thai Plum Village is a part of. 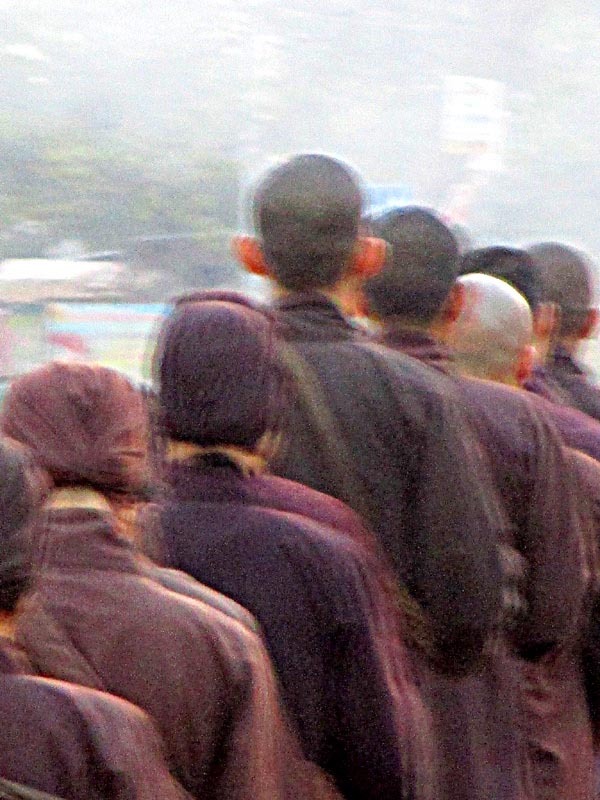 Mahayana adapts to the changing norms of society and is viewed as 'modern' by the traditionalists. 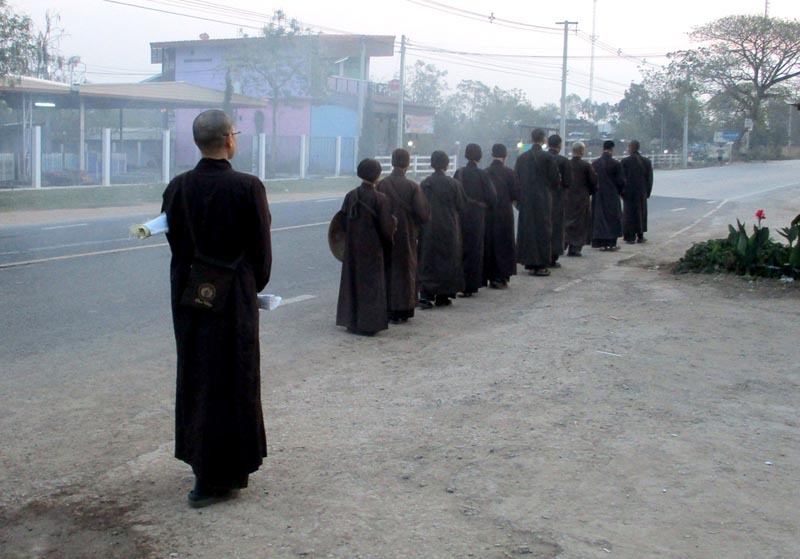 Even within Mahayana, there are other traditions, some, more open than others. 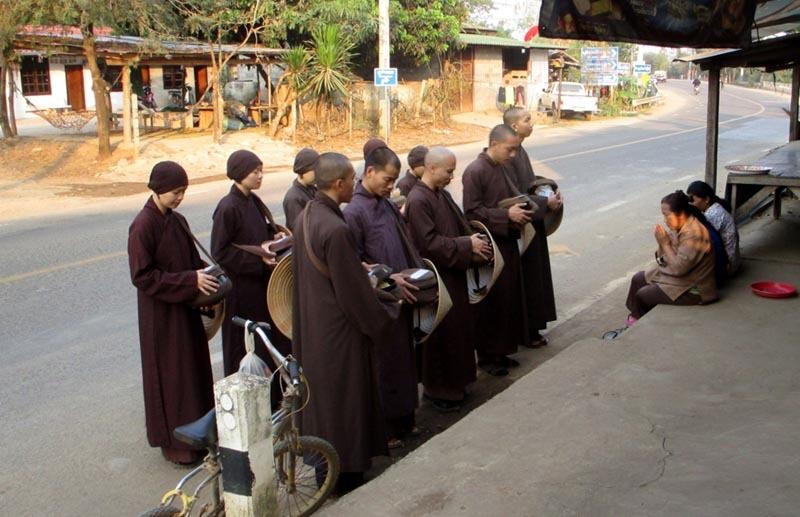 Thai Plum Village is perhaps one of the most open - it allows its monastics to play music, play sports, cook and eat 3 times daily and even have precepts to govern the use of cell phones and cars! It doesn't mean they're party people - they simply adapt to the changing norms of society and make their tradition more accessible to the younger people. 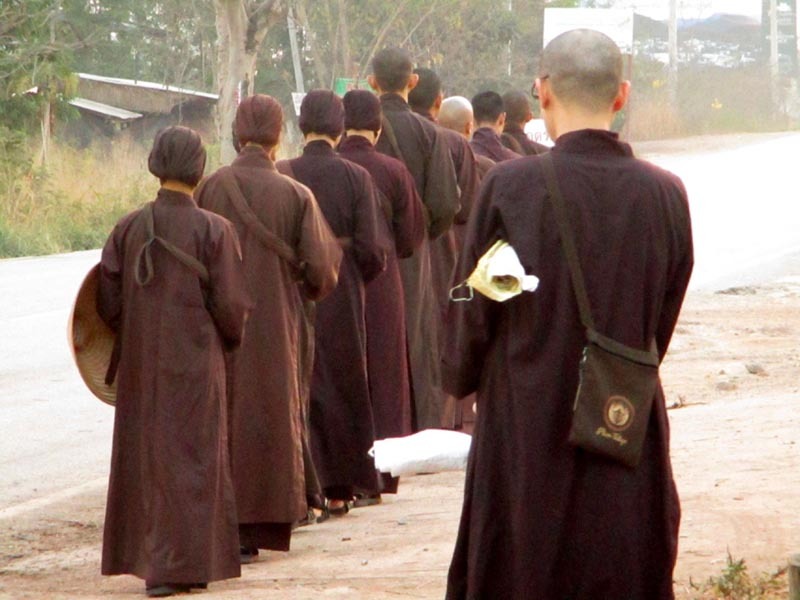 As monastics, they live by defined precepts that govern their moral and spiritual conduct. 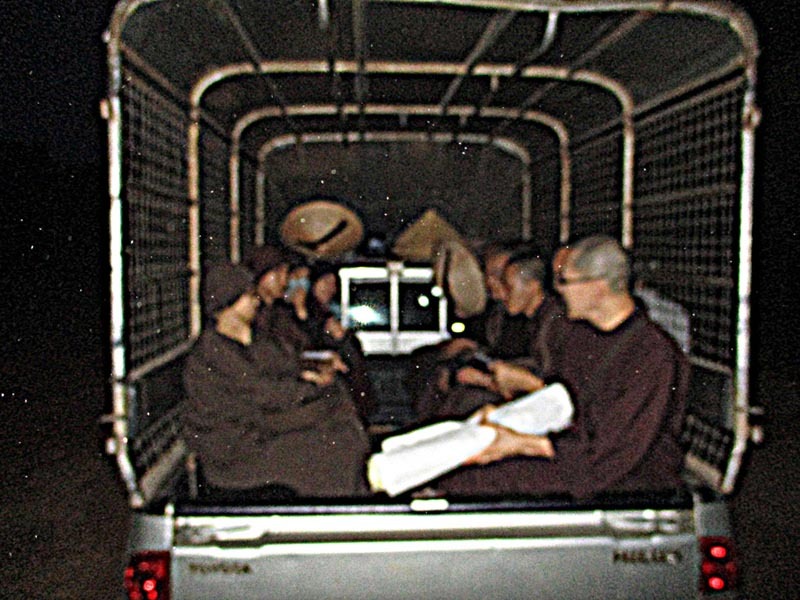 They wear a dark chocolate brown colored robe - and Thais are not used to seeing this. 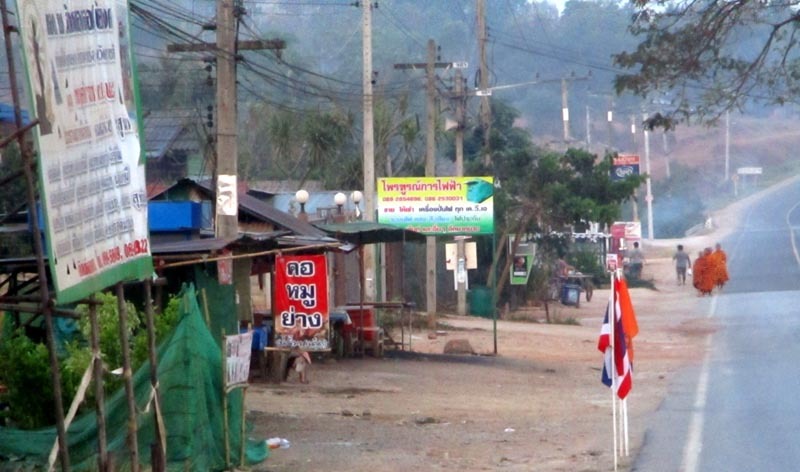 Thus, even though Plum Village is Buddhism in a Buddhist country, it remains largely unheard of, and unknown to Thais. 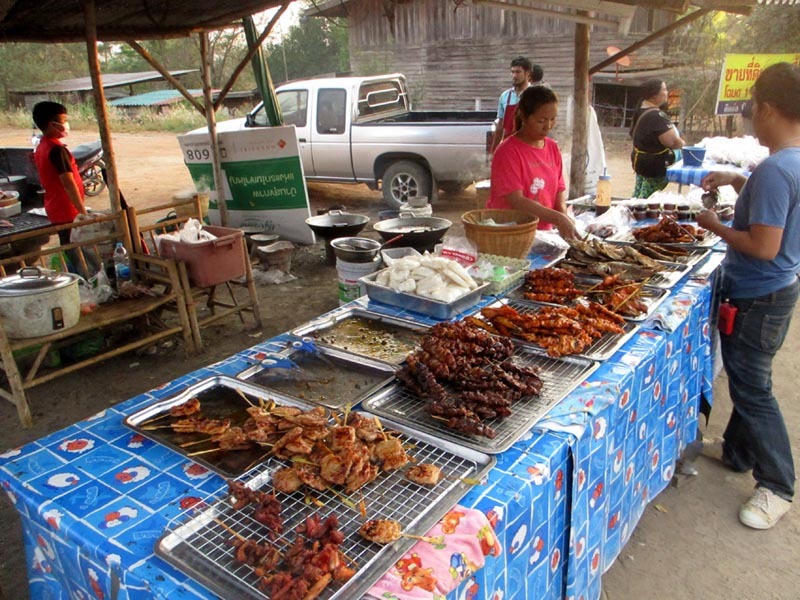 Thai Plum Village has a well-stocked kitchen and the monastics eat healthy vegetarian food. 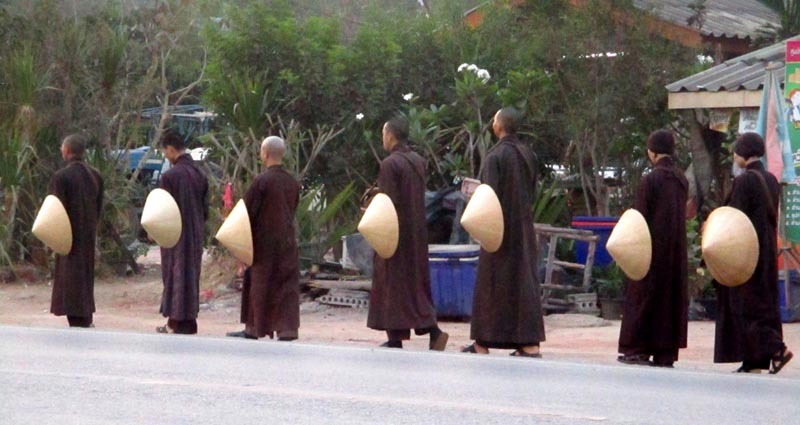 When they do the alms round, it's not really because they need food. 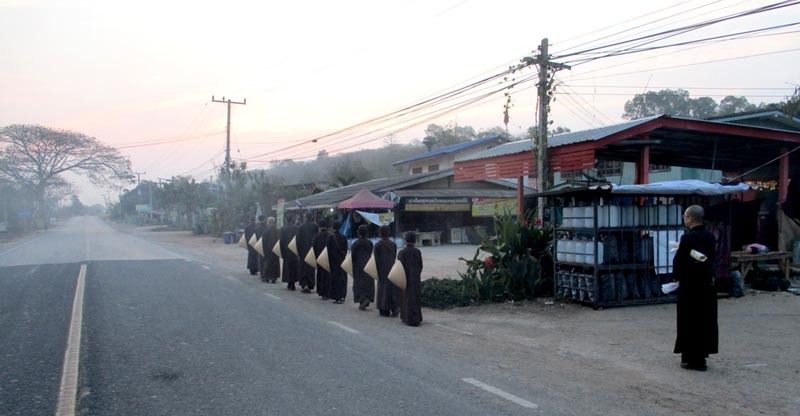 They do this because it's part of the Buddhist tradition, and also because this practice connects them to the nearby villages and allows them to share their merits and showcase their mindfulness. 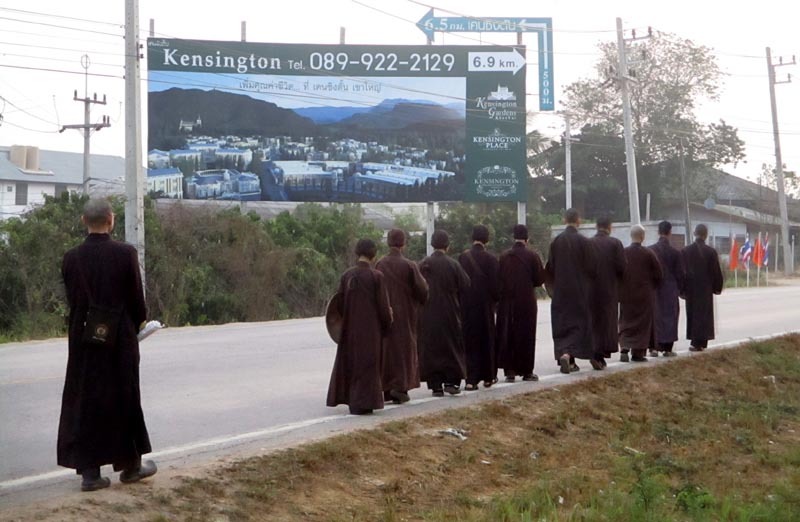 It encourages people to visit the center and benefit from its tradition. Thank you Bro. Nguyen Luc for making me a part of this time-honored tradition.